Fresh off conquering the airwaves with their hit VH1 cooking show, lifestyle icon Martha Stewart and hip-hop superstar Snoop Dogg should consider a new venture—creating a 55-plus or “active living” retirement community. The idea might sound far-fetched, but consider the forthcoming Margaritaville retirement communities. After plans were first announced early in 2017 for a Jimmy Buffett-themed development in Florida, more than 10,000 people registered to learn more. A second Margaritaville is already in the works. This raises the question: What other superstars could make a similar play in the 55-plus market? Martha Stewart and Snoop Dogg make sense for several reasons. For one, both Stewart and Snoop espouse particular lifestyles that translate well to senior living. Stewart conjures up visions of New England estates furnished with carefully curated antiques and handmade seasonal decor. And what margaritas are for Buffet fans, gin and juice is for Snoop Dogg fans. He’s all about chill vibes and indulgence. The Stewart and Snoop lifestyles might seem distinct, but part of what’s made their unlikely collaboration successful is that they have some similarities, notes Geoff Cook, partner at international strategic branding firm Base Design. Further, as Marie Yagoda wrote in People magazine, both celebrities value “accessible luxury.” Warm and cozy? Accessible luxury? This sounds like a winning vibe for an upscale senior housing community to me. One with roaring fire in a traditional sitting room and a VIP-style downstairs lounge, with all the accessories. Last weekend, I attended an NFL playoff game in Los Angeles. As chance would have it, the half time entertainment was Snoop Dogg himself. My initial thought was “how irrelevant”…as I thought he would be far too disconnected from the audience sitting in the stands. To my surprise, as Snoop began to perform, the crowd became energized and incredibly engaged in the highly recognizable song. The entire stadium rang louder than at anytime during the first half—singing along with Snoop. What a lesson to me in the cultural shift and acceptance going on in our culture. If Snoop builds it, they will come! The dining and activities at this community are no-brainers: Martha is already famous for her culinary prowess, so the menus could draw heavily from her playbook. And once a week, or more frequently, the community could host a “Potluck Dinner Party” and feature the dishes that Ms. Stewart and Mr. Dogg have cooked up on their show of the same name. Speaking of that name … potluck is a play on words, given that Snoop is a self-proclaimed cannabis connoisseur and entrepreneur, with his Leafs by Snoop brand. This is the perfect time for Snoop to make an impact in 55-plus living, as cannabis is being legalized in states around the country and is already making its way into senior living for both medicinal and recreational purposes. “The retiring baby boomers were the first widespread cannabis users in the 60s and 70s. It will be like going back to their youth, and as we age, our youth is usually all we can remember anyway!” Charlotte Peyton, vice president of business development and partner at Stratos, told me. Stratos is a Colorado-based maker of cannabis products, and helps facilitate cannabis classes at Colorado-based Balfour Senior Living. Okay, I think that a Martha Stewart-Snoop Dogg 55-plus community would be a very good thing, but it’s obviously just a fantasy. 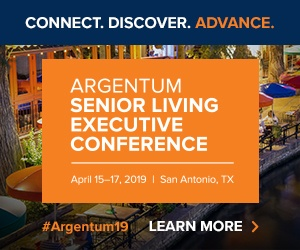 However, it is very much a reality that the senior housing industry needs to think more creatively about what communities look like and how they’re branded. Langley also emphasizes the need for senior living companies to not only generate fresh ideas but have the courage to execute.